Saturday marked the final day of competition at the flrunners.com Invitational at beautiful Chain of Lakes Park in Titusville. 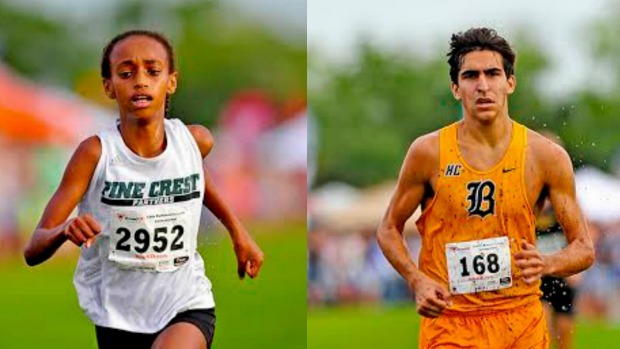 Athletes were in for a true cross country experience as the mother nature had her way previous night, dumping rain on the course, and making for a series of mud-filled 5k's.Pine Crest 7th grader Tsion Yared and Belen Jesuit senior Ryan Rodriguez (pictured above) navigated their way to victories in the Race of Champions and helped guide their teams to the championship as well. Check out over 6,500 photos, race videos, interviews, and a recap of all the action from day two! Four time Olympian and FLR15 celebrity guest Abdi Abdirahman was the starter for the girls Race of Champions and kicked off the high school part of day two. 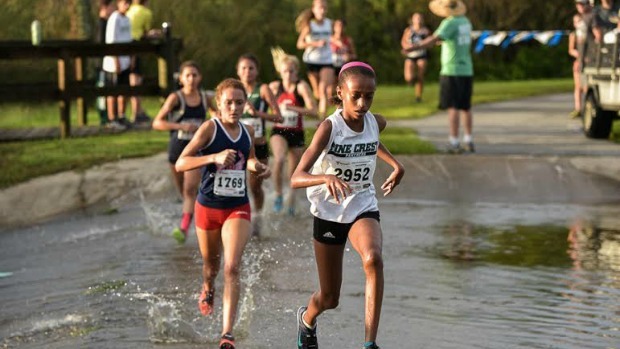 Seventh grader Tsion Yared and Pine Crest teammate Julie Montgomery headed to the front of the group along with Melbourne's Julie Wollrath, Sinclaire Johnson of Lake Brantley and ECS's Sarah Candiano. The five came through the mile around 5:30. Midway through the race, Yared distanced herself from the group with Autumn Bartlett of University and Johnson running stride for stride in second. Yared went onto win 18:33.07, a very good time considering the conditions, to pick up her third win of the year and one of the biggest in her young career. She will definitely be a threat to her teammate, Montgomery the 2x 2A Cross Country Finals champion come November. Johnson and Fatema Jaffer of rival Lake Mary had a sprint to the finish for second with the Lake Brantley 800/1,600m champion coming out on top by six tenths of a second 18:49.24 to 18:49.93. A win by Yared, sixth place finish by Montgomery, and 22nd place performance by Tsion's younger sister Madhere, a sixth grader, gave the Panthers a comfortable lead over the rest of the field. They won the team trophy with 107 points. Lake Mary defeated 1A power and 2013 Cross Country Finals runner-up Oak Hall by ONE point for second place. Merrit Island's Steven Cross and Ryan Rodriguez of Belen Jesuit jumped out to the front right off the bat. Ryan DeGale, Franco Martins, Ryan Aponte and a handful of others were in the mix as they came through the mile mark right around five minutes. When the group returned from the back half of the course and alligator alley it was a two man race between Cross and Rodriguez, who had been running side by side the majority of the race. As they came around the lake, and up the slight hill, mud and muck splashing around, it was Rodriguez with a slight edge. He held off Cross at the end to become your boys Race of Champions champion in 15:39.81, his third individual victory on the year. Cross, who was second in a tight finish last weekend at the UF Mt. Dew Invitational came across the line in 15:46.01. Joshua Jacques of Lyman ran a spectacular race to finish third in 16:01.86. Rodriguez, who recently committed to the University of Florida, became the second individual from Belen Jesuit to win the ROC joining Eddie Arguello. Arguello, won the race in 2004, in the race of his life that he dedicated to his father who was ill at the time. His father passed away in the weeks following, and it was the last race he was able to see his son. 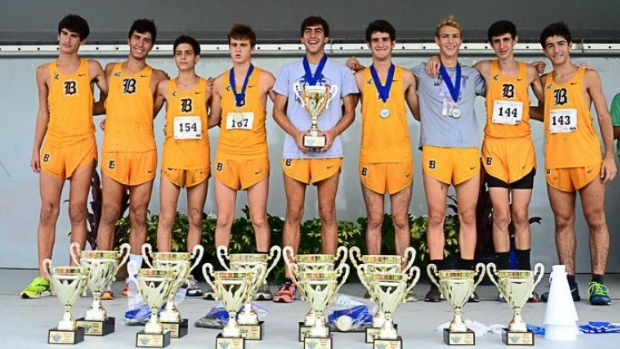 Belen Jesuit captured the team title convincingly for the fifth year in a row and sixth in the last seven. The Wolverines placed three in the top fifteen and five within in the top 33 to score 63 points. Lyman, who won the Astronaut Invitational on this very same Chain of Lakes Park course at the beginning of the season was second with 119 points led by Jacques' third place finish, Jordan Armstrong (14th), and freshman Bryce Bell (17th.) The biggest surprise might have came from the Osceola County program Liberty. The Chargers were a late addition to the ROC and with a strong showing from Rogelio Araiza (6th) and Celebration transfer Justin Corinealdi (28th) placed third overall. St. Augustine's Kelly Aponte went out with the pack in a rather slow first mile of around 6:13 running along side teammate Emily Onimus and Lyman's Shannon Grace. Her game plan paid off as she crossed the line first in a new personal best time of 19:44.27. Palmetto Ridge won the team trophy with 148 points. Seffner Christian Academy junior Noah Perkins picked up his first win of the year, with a time of 17:00.09, out distancing himself from the competiton early on. Lakewood Ranch was your team champion with 77 points. In a Space Coast showdown Eau Gallie's Dominique Coriell and Vierra's Molly Bryan kept it close for 3.1 miles. Coriell a sophomore came away with the win in a time of 20:59.63. Vero Beach won the team title and unlike the boys race Cardinal Gibbons came away with the second place trophy in a two point victory over Wellington. Five girls broke 22 minutes led by individual champion Bronwyn Eyeington of Suncoast. Eighth grader Jaden Ault and Taylor Melnick finished fourth and fifth to give Circle Christian the team title. Suncoast was second eight points back 83. A week after finishing third at the Overbay-Monte Carlo Invitational, Hagerty junior picked up the win in 17:12.14. 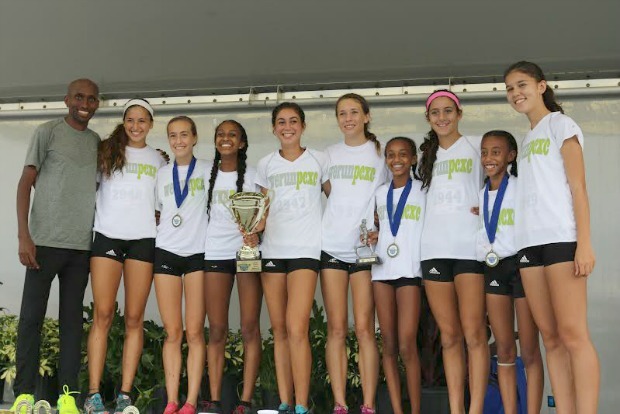 Freedom High School (Orlando) 1-5 split of a mere 26 seconds and team average of 18:07 gave them the team title easily. Barron Collier and Cardinal Gibbons duked it out for second with BC winning by one point 120-121. A week after finishing second at the Embry Riddle ASICS Cross Country Classic, Mount Dora's Sadrick Sedere finished first with a time of 17:27.66. Cypress Bay beat Satellite 91 to 94 to take the team title. Lauren Garcia of Lourdes picked up the individual win in 23:08.71 and helped her team to victory with a score of 34 points. George Jenkins was second with 43 points. 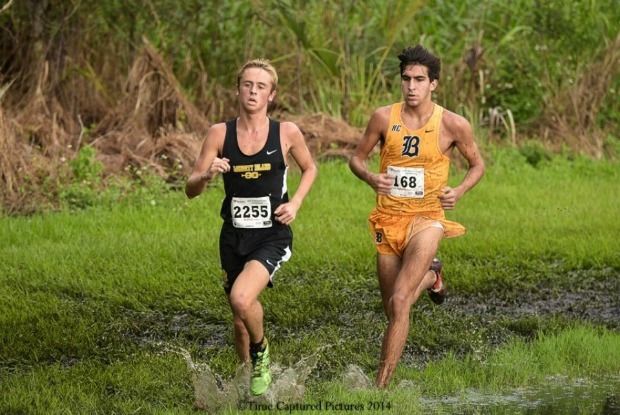 Senior Matthew Mullin Garcia led Belen Jesuit with an individual time of 17:44.11. The Wolverines place five in the top 13 to win with 28 points.